Home / TallyERP.9 Lessons / What is advanced Search in Tally.ERP9 and How to Use IT? What is advanced Search in Tally.ERP9 and How to Use IT? We always talk about tally support for manage accounts, inventory, compliances etc, and Tally makes daily accounting very simple for business entities. Advanced search feature is a very powerful option provided by Tally but used by only some users. Now today we discuss its advanced feature which is very useful. Through Advance Search Feature you can find any narration, any cost center, any ledger, any ledger amount, any inventory details, any employee data (in payroll), any cheque detail, any excisable unit detail, any godown detail etc. For Example, Your Bank has more than 1 Lac Entries in a FY and you need to search the specific entry in the whole year then what you have to be done? Advanced Search Option help you to find the Entry and show you on your screen. For Example you need to search entry with the name of Rahul in narration, then which conditional advance search will be applicable on this. Below image is show the solution of this problem. When you want to apply advance search Press Ctrl+F12 on Cash + Bank Details (This method only applicable on summary of every ledger, Press Alt+F12 to do advance search in ledger account daily summary). You can see above report in Tally. If you want to search narration then select narration and press enter. Now select containing (This means if rahul name contains anywhere in Narration then tally find it for you) and press enter. Now enter name Rahul and Press Enter two times. 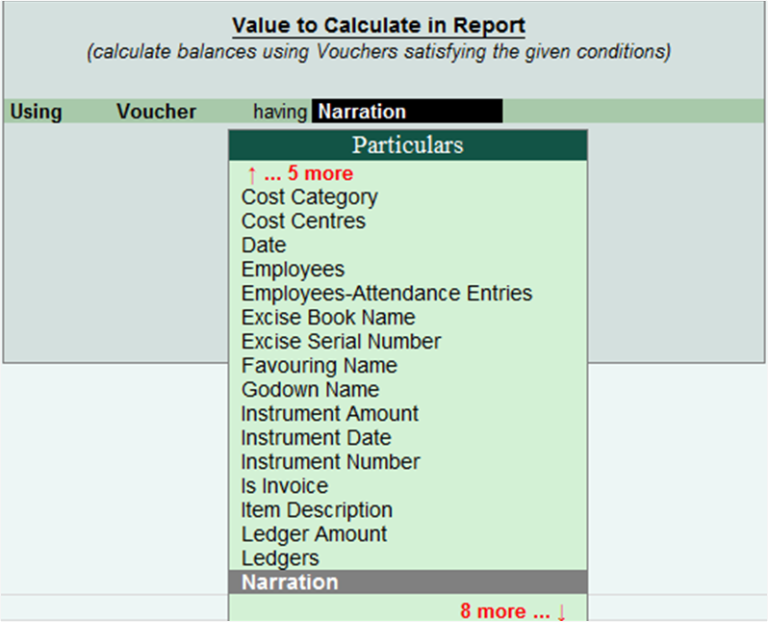 If any voucher having narration Rahul then tally find it for you. For more information please see below video.